Zurfiz fitted kitchens offer the ultimate in enlightenment with an outstanding commitment to quality and style and a FIRA Gold award for excellence in furniture. You have a choice of colour options and you can mix and match the colours within your kitchen design. You can see some examples of this in the sample kitchen designs below. The kitchen doors used in Zurfiz kitchens are 18mm thick. Select one of the sleek utragloss solid finishes for your kitchen, you won’t get a better high gloss finish from any other kitchen door on the market. There are also ultragloss woodgrain finishes for that unique look, together with metalic finishes. 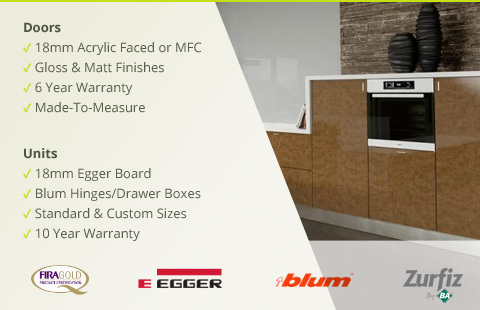 All Zurfiz replacement kitchen doors offer a choice of edging including brushed steel effect, glass effect or matching. Inset kitchen handles are also an option in this range, see individual product pages for more information on these.